Each Sunday we go to church as a family. We learn about Jesus and His atonement. We learn about His commandments and how following them can bring us peace. We go to a total of three hours of meetings. For about two thirds of the time we are broken up by age group, so kids are in classes that are designed to help keep them engaged. Each time we bring home a new child, there is an adjustment period as they discover that Christ's gospel and attending church are a big part of our lives. Poor Conner has had a tough time sitting through three hours of church during which he not only endures instruction in a language he can't understand, but also sits there patiently in complete darkness, not even able to see his surroundings. We've actually been bringing him home early most Sundays because of how difficult it is for him. In order to help him understand more about what we're doing and why we're doing it, we've enlisted the help of the local missionaries. Yes, those boys in white shirts and name tags have a presence even here in Utah, the home of the Church of Jesus Christ of Latter-day Saints. But the missionaries in our town don't speak Chinese, so we've been able to take Conner to Temple Square in Salt Lake City to meet with a sweet, Mandarin speaking missionary there. For those of you who don't know, Temple Square is a popular tourist destination, with visitors from all over the world. To help accommodate those visitors, missionaries are called from many countries to serve for 18 months at Temple Square. Together, these missionaries (all female) speak just about any language you can think of. Last Sunday we took Conner to Salt Lake and met with Sister Jin, a missionary from China who would be teaching him about Jesus. There are not many members of the Latter-day Saint church in mainland China, so most of the Mandarin-speaking sisters on temple square are from Taiwan or Singapore. What a pleasant surprise for all of us when we found out that Sister Jin is from mainland China. What an even greater shock when we found the she is from Conner's hometown of Wuhan and that they were able to speak the same local dialect and talk about some familiar places in that city. We felt it was truly a tender mercy from our Father in Heaven as Conner was able to speak with someone to whom he could relate so well. We stayed at Temple Square for about 90 minutes. Conner learned many things about the Savior and about Father in Heaven and His plan for us. He learned more about why we pray and how to pray and has been saying his own prayers regularly for the last week. He is such a sweet boy. As we've talked to him over the past couple of months, we have repeatedly told him that Jesus Christ let us know it was right for him to come to our family and be adopted. Conner loves Jesus! 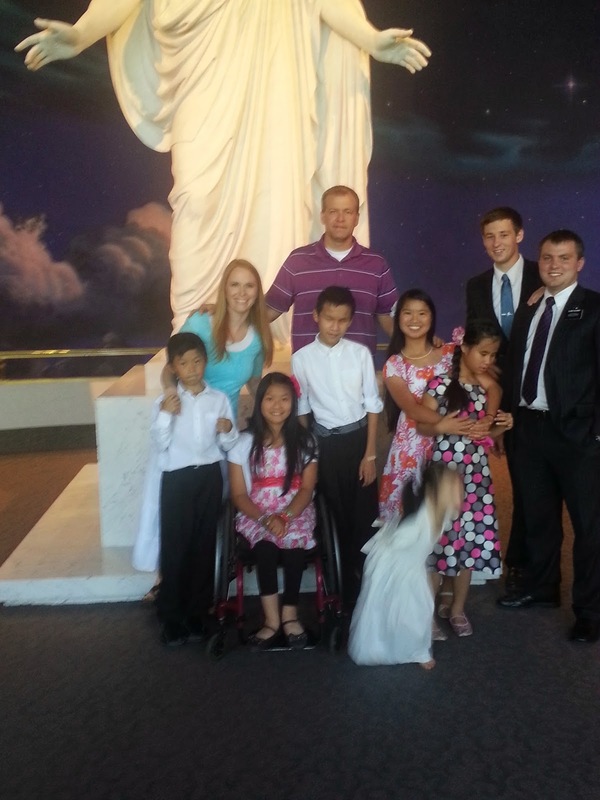 We look forward to more meetings with the missionaries and hope that Conner will decide to be baptized. I am so happy for Conner to be able to talk with someone about the Gospel who could also relate so well to him. As you say, it was a beautiful tender mercy from our Heavenly Father. Of that, I have no doubt. Give Conner a big hug from me. How I remember this time when I first brought my daughters home, too. We went up to the visitor's center by the Oakland Temple. Like Temple Square, there are sister missionaries who speak every imaginable language and there were plenty who spoke Mandarin and Cantonese. My girls haven't been baptized yet, but they love church, are learning to love Christ and the Gospel and they pray beautifully. One of my favorite prayers was when my 13 yr. old, concerned about my indecision about letting her and her sister attend a mutual activity pool party since they both can't swim, asked Heavenly Father to bless her so that she wouldn't drown and mommy would let her go to the activity!